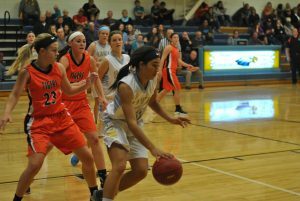 A 19-4 second quarter gave the Lynnville-Sully girls basketball team the momentum and a solid lead they would never relinquish in their season opener last week. The girls won the home game, 51-28, against Iowa Valley on Friday, Nov. 18. They relied on good defense and solid rebounding for their comfortable win. Junior Jataya Meyer dribbles away from her Tiger defender in the opening game of the season last Friday. She scored three points for L-S. The leading scorer for the Hawks was senior Brenna Lanser with 18 points on 22 shots. Sophomore Carson Fisk put up 10 points on 12 shots. The next leading scorer was junior Mariah Vos with seven points on 10 shots. As a team, L-S made seven of 14 free throws, four of 16 three-pointers, and 20 of 63 shots. The Hawks relied on a 28-14 advantage on the offensive boards for extra opportunities. This led to a 20-5 advantage in second-chance points. The Hawks also led in defensive rebounding with 31 to Iowa Valley’s 21. The leading rebounder on the night was also Lanser with 14, five of them on the offensive side. Fisk got 12 boards with seven coming on offense. Senior Jelissa Rozendaal had nine rebounds with five of them on the offensive side. “We’ve been working really hard in practice on our rebounding because we’re a shorter team. It’s nice to see that all the hard work paid off in the game,” Rozendaal said. The Hawks stay at home for their next game against BGM on Tuesday, Nov. 29.